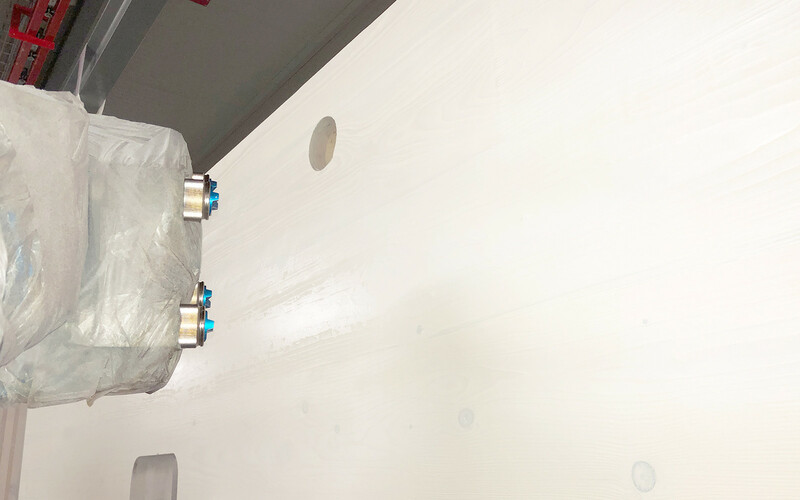 Even multi-layered setups with intermediate sanding are no problem for the surface refinement centre at the cross-laminated timber production site in Stall, Austria. A fully automatic scanner recognises the geometry of plates. Components are recognised automatically and processing is implemented digitally from the customer orders without any detours. 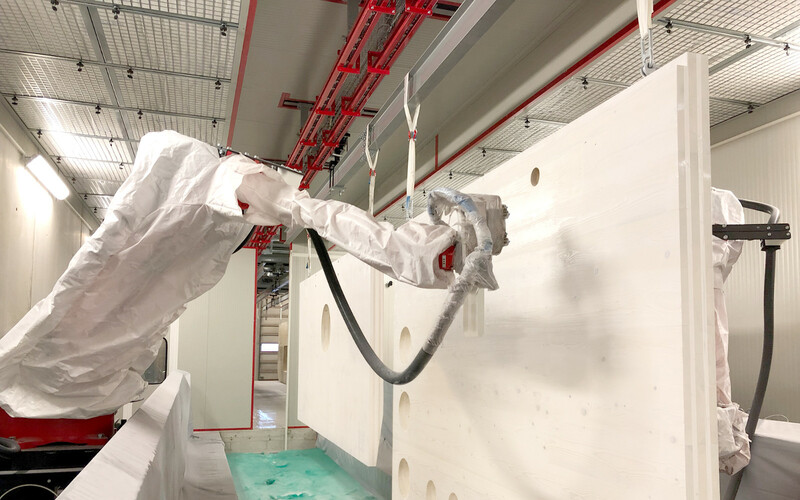 Two CNC-controlled robotic arms, each with four spray nozzles, can manage up to seven colour cycles, ensuring an excellent coating of the surface. 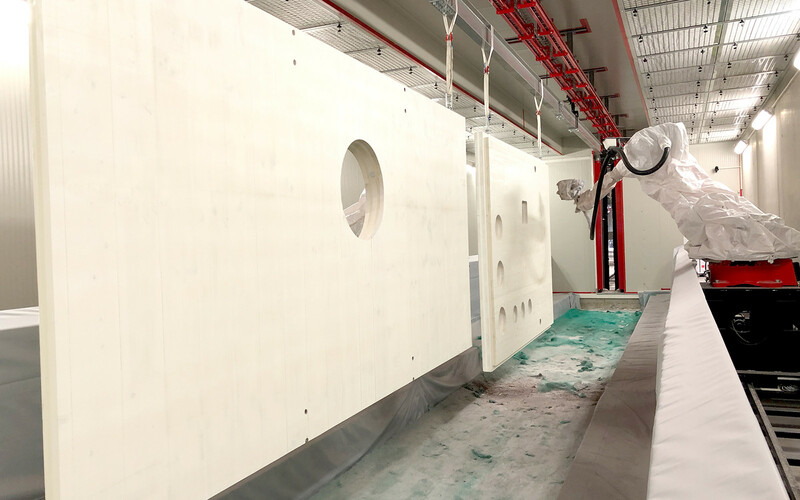 Subsequent drying is carried out using hot air that is dehumidified beforehand. The fully automatic intermediate polishing machine smooths out fibres and prepares surfaces for a second layering. All-purpose coating for internal and external using standard white finishes (for indoor use only) and grey colours. On request, special colours for specific projects are also available. Coating finishes for residential property: colourless wax glazing based on natural resin and linseed oil varnish for indoor use. Water-based, colourless coating including blue stain protection for external use. On request, special colours for specific projects are also available. Water-based intermediate and final coating for oiled surface finishes, especially suitable for wood surfaces made of oak, birch and larch. Transparent UV and yellowing protection, especially suitable for light wood surfaces such as spruce, fir and birch. Water-based impregnation to protect against blue-staining fungi, decay, insects and termites. Temporary, transparent moisture and dirt repellent building site and assembly protection for interior and exterior application on surfaces. End-grain protection to prevent the absorption of moisture during assembly, especially recommended for large construction sites. Fire protection impregnation to achieve B-s2, d0 for internal and external areas that are not exposed to weather; additional chromophoric coatings is available on request. 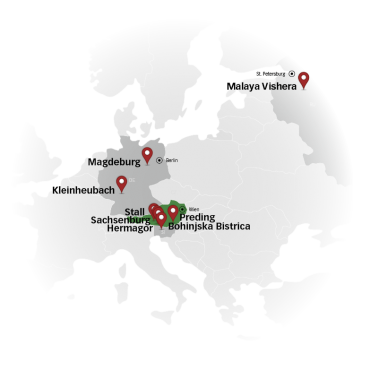 Holz.bau forschungs gmbh, Graz University of Technology's Competence Center, developed and maintains the design software CLTdesigner. We are permitted to provide our customers with this design software for designing walls and ceilings in cross-laminated timber free of charge and without obligation. For questions about this program, please contact Mr. Jeitler.